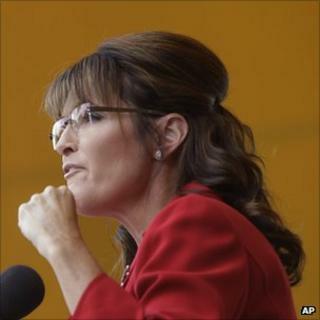 Sarah Palin's decision will have disappointed some. Not the American people who clearly didn't like her as John McCain's running mate in 2008. Not Republicans: 72% of party supporters did not want her to run. Some are fervent supporters, of course. One says America doesn't deserve her. But the disappointed are mainly journalists who yearned for this colourful character to enliven the Republican race. British journalists in particular, who knew that she embodied just about everything the British left loves to hate about the American right. Come to that, I can't think of many British conservatives who would want her at their conference. But for a certain type of Brit she is as good as a ghost story to send shivers up the spine, a spookily attractive perfect fright night. Shriekily filled with venom against a president she branded a socialist and suggested was un-American; in love with guns, God and the unborn; apparently ignorant of the outside world; indeed not fully clued up on the lower 48 (the USA outside Alaska); she was portrayed as a caricature of American conservatism at its crudest. What her decision is not, is a surprise. I always thought her motivation was political, and disagreed with those who thought she was stringing this out for stardom or money. I still think it is true belief that drives her, albeit tinged with a heavy dose of self-promotion and a measure of self-interest. But she must have seen what was obvious. Not just that she could never win the presidency, but she could never win the Republican nomination. It must be galling. She's too glam to play a good John the Baptist. But her vice-presidential run was the first public manifestation of the Tea Party spirit, and she opened the way for their existence. The political phenomena of Palin made a certain narrative about Obama, not just acceptable but essential on the Republican right. As a result we have Michele Bachmann in the race. Herman Cain in the race. Rick Perry in the race. They are all more authentic, more intelligent, more acceptable than Palin. Her candidacy would have made a few days brighter for the likes of me, but would have made little difference. She wouldn't have outshone her opponents, only put four more paws and a few sharper claws into the cat fight on the right. Romney would have smiled ever harder, and looked on with even greater glee than he observes the current conflict. With Christie out of the race as well, playtime is over. It is Mitt versus somebody, almost certainly Perry. This is the way it is. Will we miss the spills, the thrills, the glamour and the charisma?